Zidane’s assertion is obviously a piece of debate, but very few will doubt that since his arrival in 2009, Ronaldo’s influence at Real Madrid has been nothing short of a fairy tale. The exciting argument over who is the best player in Real Madrid’s history, or in world football, will never give a conclusion to satisfy everybody, but that’s basically half the reason this beautiful game is still the world’s most popular sport. Meanwhile, it’s also not an exaggeration to claim that over the past decade, Sergio Ramos has highlighted the La Liga giants’ greatest value for money, if you talk about something on the pitch. Ramos cost Real Madrid €27 million when he roped in from Sevilla as a 19-year-old highly talented lad in the summer of 2005, which is, in turn, a mere drop in the vast ocean of the Bernabeu club’s unique transfer outlay. Since then, the Spaniard has made 492 appearances across all official competitions, and has netted 63 goals while fetching 35 assists – an outstanding figure for a modern-day central defender. We all know the 2005-06 season saw a period of transfer scrimping in La Liga. Barcelona spent not a single penny and Atletico Madrid’s biggest deal was with Martin Petrov (€10m from Wolfsburg), while Valencia grabbed a bargain in €12m David Villa from Zaragoza, and Sevilla decided to reinvest only €6.5m of their Ramos money to land Frederic Kanoute from Tottenham. How Deportivo were able to squeeze up to €20m out of Newcastle for Albert Luque in such a tight market still remains an unsolved mystery, but Ramos was definitely a bargain, even if he became the most expensive transfer of that summer in La Liga, and the most valuable Spanish teenager in history at that time. Sergio Ramos unleashed his first goal for Madrid against Celta Vigo on 6th December, 2005. It was an excellent header from a Raul Bravo free kick. The now-club skipper has enjoyed quite a colourful career of jumping up with key goals, and plenty of them come from crosses into the box where he supremely defies his unimposing 6-foot figure to out-leap defenders. This season alone, Ramos has rescued his team against Villarreal (1-1), Barcelona (1-1) and Deportivo (3-2) by using his head, with the latter two goals both coming in stoppage time. The 92nd-minute header in Lisbon lead Real on their way to the Decima in 2013-14; the opening goal in the second leg of the Champions League semi-final against Bayern the same year, after which he added a second just four minutes later, put the tie beyond the German giants; a 92nd-minute header in the 2016 UEFA Super Cup final while 2-1 down against Sevilla is also a remarkable goal on his list. You can simply say: Ramos is king of the timely intervention. 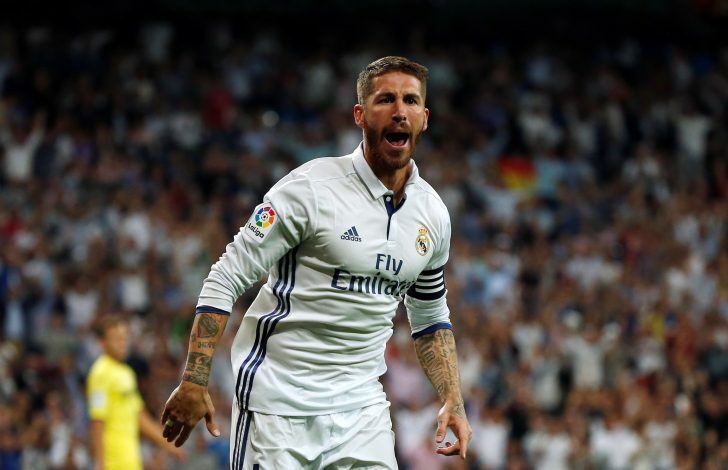 The last time Real played in the Club World Cup hosted by Morocco in 2014, Ramos was the Player of the Tournament, after opening the scoring against Cruz Azul in the semi-finals, and once again against San Lorenzo in the final. Zidane will not be able to call on his true captain for Real’s opening match against Club America on Thursday, but Ramos will be available for the final if the European powerhouse can beat the CONCACAF Champions League winners. That is certainly difficult to dispute, even in the age of €300,000-a-week contracts and €100m transfers. But what is completely irrefutable is that the best money Perez has splashed out, euro for euro, during his two tenures in the Bernabeu boardroom was on none other than Sergio Ramos – a passionate warrior who would go on to stand out as one of the most influential Real Madrid players in history. “He is a symbol of Madridismo,” says Real Madrid president – who has a special affection for the only Spanish player signed during his first mandate – when Ramos renewed his contract following a short funny flirtation with Manchester United last year. Many believe that Ramos will eventually succeed Florentino Perez in the big chair one day. But in the immediate future, he will be looking forward to the perfect end to a fabulous year personally and collectively. A 92nd-minute winner to kiss the Club World Cup trophy, perhaps? 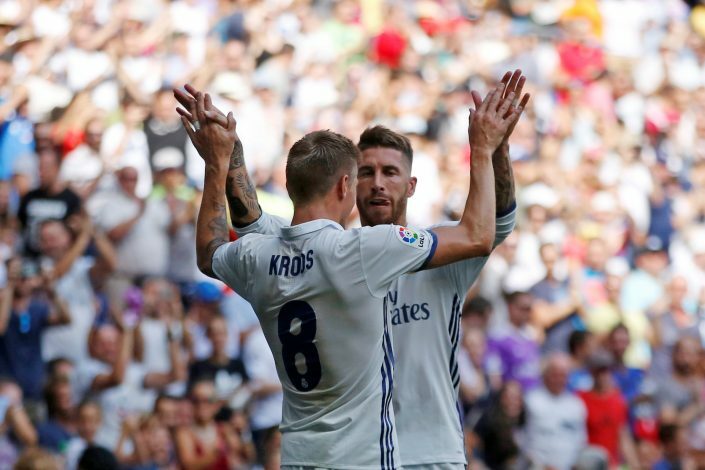 Both Club America in the semi-final and Kashima in the final will have the ultimate say in this matter, but as Ramos has showed time and again, match-winners at Real Madrid are often more back than front. Sergio Ramos speaks truly for himself. He has always talked about his love for Toreadors, the risks they love, the nerve and the “show” which they accompany. Like bullfighting, what’s a clear-cut aspect is that this has been passed down to him via his father and grandfather. It’s what Ramos once, originally, wanted to follow as a profession. In fact, during his second year at Madrid, he actually jumped into the ring with a 500 kg bull, without his club’s knowledge or consent. He will happily relate how as a kid he was “always the first or second” to be called in for kick-about games in the schoolyard or the local park. In those fights, when there was a free-kick or a penalty, he would take them, even as an undersized kid, and way back then, he would be humiliating keepers with Panenka penalties. All this you see now, it’s not for show or for dough, or for ego or the marketing. It’s him. You can call him football’s Errol Flynn; a dashing, swashbuckling adventure lover whose ultimate triumphs smack of greater romanticism, having always overcome adversity. Without the errors, the setbacks, the red cards and the controversy, the heroism, the glory, the laughs, the trophies and the derring-do would not be so much bright. Earlier this month, Thierry Henry talked about the impact of Dani Alves’ departure on Barcelona. And it was that conversation which somehow relates these two former Sevilla teammates, the Brazilian and the Andaluz, who share a similar philosophy of life. Speaking about his approach to the risk vs. gains assessment, Alves once told: “When you do what I do you’re high visibility when things go wrong. But when I first decided to compete at the highest level of football I took on board what my father taught me: That to win you must take risks, you must be daring. So, what do you prefer – the Errol Flynn comparison, or simply calling Ramos “the Dani Alves of Spain”? Worth accepting, worth watching on good days and bad, also worth listening to and worth his weight in gold – not just to anyone who truly loves football, but to anyone who is in love with life and the human condition in all its impairments and glories. Viva Sergio Ramos. He who dares, wins!